The latest version of WhatsApp comes with fascinating features, which many people don’t know about. well, I will be sharing with you one of these features in this post. I hope you all know that the ‘Who read my message’ feature is not new to iOS, but it’s new to Android. 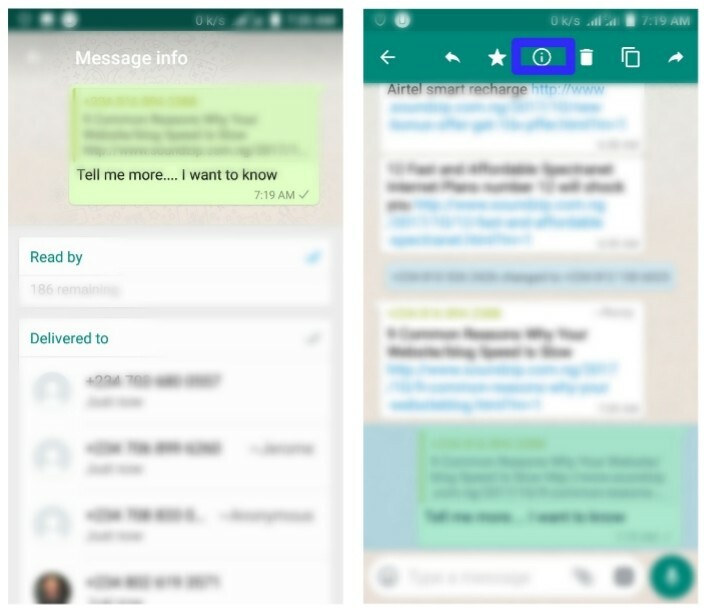 You can now know who has read your message on the WhatsApp group. It’s very annoying when you send a message to WhatsApp group and nobody responds, thinking no one has read your message, whereas they have read it but they ignored your message. This post will put an end to that. Related post: secretly view All your Social Media Messages without Your Friends Knowing. Steps On How To Know Who Has Read Your Message On WhatsApp Group (For Android Users). Then the list of those that have read your message will appear. That’s all, as simple as ABC. With this few steps you should be able to know who has read your message on whatsapp group. 5 Advantages Of Having A Blog For Your Business. Whatsapp Launches Live Location Sharing: Here’s How It Works.